Last year: I did not rank Plocki. He redshirted. Plocki is a walk-on who did not play last season. Michigan has a void at fullback after the co-starters – Khalid Hill and Henry Poggi – graduated. The likely replacement is sophomore Ben Mason, who hurt his knee during spring ball. 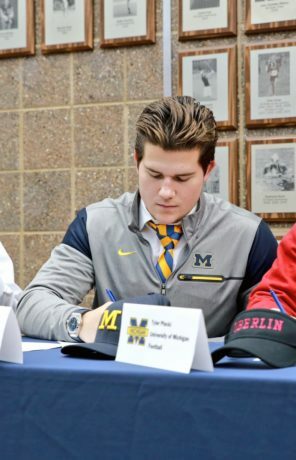 Michigan will be trying to find a backup fullback or two, and after incoming freshman Ben VanSumeren, things get murky. Plocki will have a chance to earn a role, though I think it’s unlikely he ends up in the top three at fullback. Seriously? Seriously. You’re going to write up and include 31 Walk-ons in your list. Man, you’re just showin’ off. Echoing leftrare’s comment, this (116 entries) is ambitious. I like it! Before calling me a show-off, you might want to see if I can finish the task. Hopefully I haven’t bitten off more than I can chew! Your work is. Much appreciated. Dont forget anybody! How do you do this? By that I mean, what do you use to compile and sort your list? Is it some big spreadsheet with columns for various attributes which you then assign numbers to, which you then crunch to come up with some “value” number you sort on? If “yes,” would you care to share the list of attributes you assign numbers to? What was up with the talk that Kareem Walker was switched to FB? Do you know is there anything to it? From what I heard, that is not the case. He is still a tailback.